It’s my son Karel’s birthday tomorrow. I won’t tell you his age because it’s a bit scary – for all of us, but Happy Birthday, Karel!! Naturally, we asked what he’d like for his birthday dinner. His answer was not unexpected: roast beef and Yorkshire pudding with Caesar salad on the side. He also wants my mom’s lemon pie, but not with meringue. Karel is a whipped cream kind of guy. He sort of shrugged when we asked about an appetizer, though. 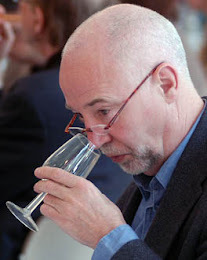 When we have a family meal, we like to sit around and chat first, so we generally do without a first course, opting to relax in the living room enjoying some sort of “nibbly” and a glass of wine before adjourning to the dining room for the main course. For Karel, I’m making some of his garlic bread (a recipe we’ll share in the future because it’s a bit out of the ordinary and extra tasty). To be honest, Vicki and I, along with our other son, Jan, and his lady, Rena, although we might join Karel in a small piece bread, would prefer something a little different. Vicki and I settled on poached asparagus spears wrapped in a bit of smoked salmon with a dab of the special cream cheese (more like mascarpone) we buy from Chris’ Cheese Mongers at the St. Lawrence Market. To be honest, though, part of our reason for this choice was merely an excuse to smoke some salmon. Now that we have a vacuum sealer and can freeze it without the worry of ice crystals forming in the meat, it’s something that is now going to be a staple item in the house, rather than an occasional treat. Our fickle weather even cooperated. I’ve been trying to smoke salmon for several weeks now, but couldn’t seem to find a day where the weather was going to be warm enough to cold smoke. That sounds sort of silly, but last winter I smoked a chunk of salmon and it froze solid. Our A-Maze-N Pellet Smoker really gives off that little heat. It’s a good thing when the temperature is pushing 60° in the spring or fall, but not a good thing if it’s −10° – and it was down there quite a lot the past month! With an eye on the long-range forecast, I decided to pick up some organic Irish salmon from Domenic’s, our preferred fish monger at the St. Lawrence Market, and get to work. Ready for the top layer of cure, lemon and dill. 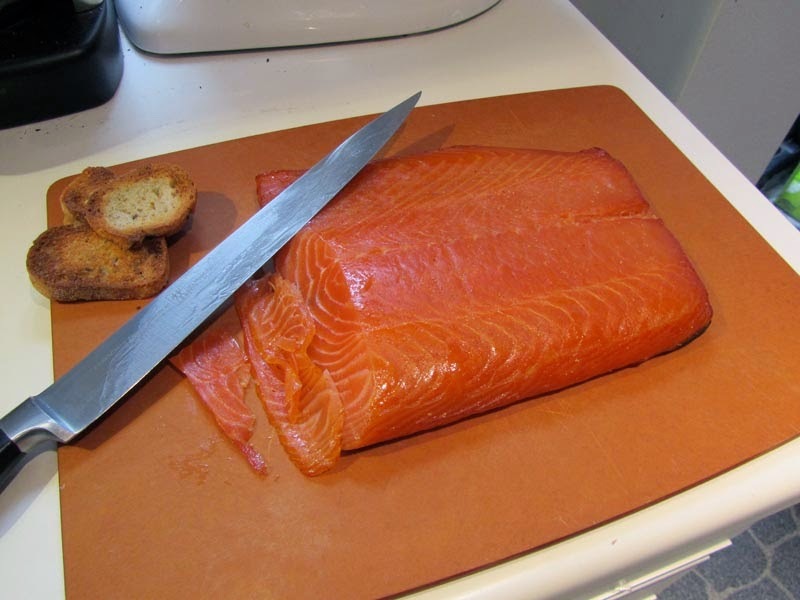 People always seem stunned when we tell them we smoke our own salmon, but let me assure you, as long as you have some sort of way to cold smoke (and we heartily recommend the A-Maze-N Smoker line – whether pellet or sawdust), producing great smoked salmon is simplicity itself. I know I say that a lot when talking about charcuterie, but it really is true. Subtract the time needed for curing, drying and smoking (where you do zero work), and all told you’re looking at no more than a half hour of actual work time. Want to try our recipe? Read on. But ours is not the only way to go. There are lots of alternatives for flavorings out there on the internet. However, I do recommend our approach to curing the salmon for smoking because it works very well and will give superior results every time. It’s critical to find the freshest and best salmon you can find. If it smells fishy, take a pass. Check to make sure all the pin bones have been removed. You’ll feel them immediately if you wipe your palm down the meat side of the filet from front to back. We keep a needlenose pliers in the kitchen drawer to pull these out whenever we filet a fish or buy a fish filet and discover some. You don’t want to run across one of these by accident when you’re eating! Rinse off the salmon on both sides and pat dry. Place the filet skin side down on top of the dry cure, then put the remaining cure on the meat side of the filet, getting more on the thicker top portion and less on the bottom. Rub it in gently. Top with a layer of lemon slices, followed by the bunch of dill just torn up by hand. Cover with plastic wrap. 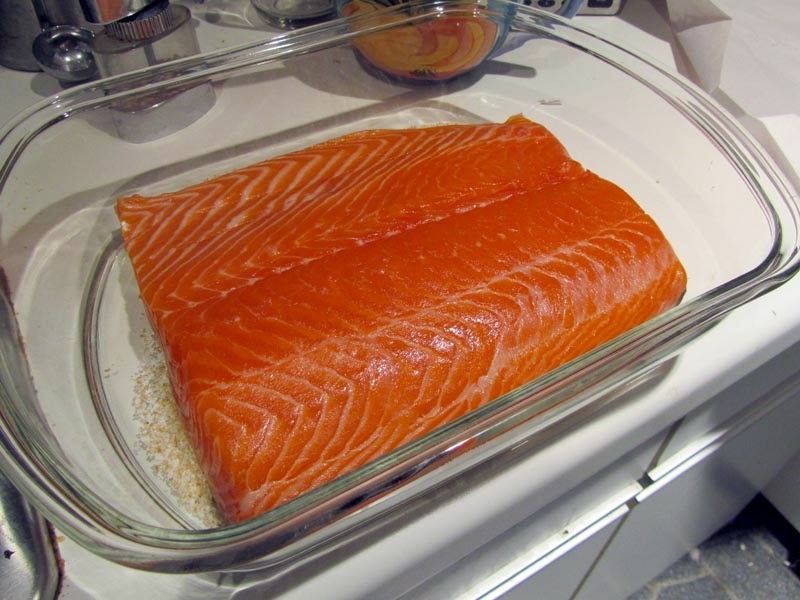 Now place some folded foil over it, or if you’re lucky like us, a second glass dish that will nest on top of the salmon. Weight it with some food cans or maybe even a couple of bricks (what we use). You need around 6-8 pounds of weight to squeeze out the liquid that the salmon will throw off. Refrigerate for 24-30 hours. You’ll see longer in other recipes, but we find the shorter time gives you more succulent and buttery salmon. And it won’t be too salty! When the salmon is done curing, rinse it thoroughly and pat it dry. Throw away the liquid in your curing dish, wash and dry it. Now place the salmon back in and pour half the vodka over it. Cover it again with plastic wrap and return it to the fridge for an addition 6-12 hours. Next, remove the salmon from the dish, put it on a rack and let it dry uncovered in the fridge for 24 hours (or at least overnight) so the surface of the filet develops the “pellicule” (stickiness) that will help the smoke adhere to the meat’s surface. Fire up your smoker and when it’s going well, smoke the cured salmon for 4-8 hours. We generally prefer it smoked around 6 hours, but I’ll give you the latitude depending on how smoky you like your food. We’ve found that going past 8 hours is too much and throws off the balance of flavors. When the salmon comes out of the smoker, place it back in the glass dish, dribble the remaining vodka over the surface and let it sit for a few hours before slicing it thinly, on an angle, for serving. If you’re going to freeze it, I’d suggest slicing it into hunks and vacuum sealing it (really, the only way to keep it at its peak of flavor and texture). If you don’t have a vacuum sealer, ask your fish monger to do it for you. When you want to serve some, just thaw it completely before you slice it.